Discussion in 'Sick Plants and Problems' started by tryisforfail, Jun 13, 2006. To be blunt, it sounds like you did everything wrong -- too hot, too much water, fertilizing too young, not enough light. Read the grow guides and deep into the forums before starting your grow. As usual, I agree with everything Toasty had to say. You fed the plant way to early. They don't need food until at least week three. Also, your temperature really should not go above 85 degrees F because any more will slow growth and 95 plus degrees will probably start to kill it. Give it 18 hours light 6 hours dark. Not sure if it will survive. All you can do is give it the proper light but, it looks like it wilted from extreme heat. Get it to a cooler place and see what happens. what i everyone seeing in the pic?? 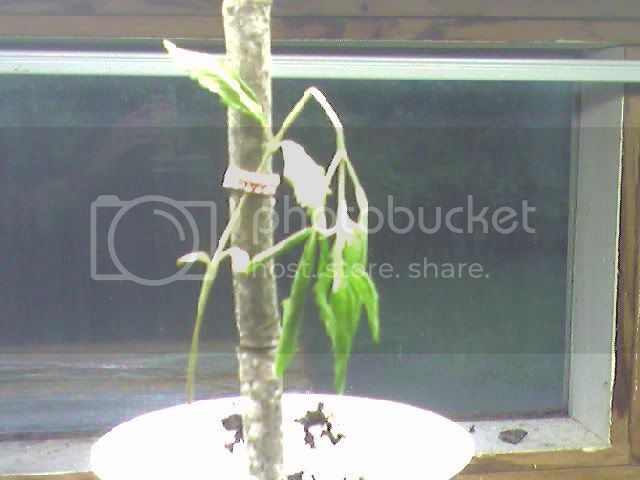 i see a young MJ plant strapped to a big branch, looks like it has been cut as well the bottom just finishes, no roots into soil. I will start with the fertilizer part of the equation. As we all know, with out food we die. If a plant does not get the food it needs it will get sick and die as well. A root systems favorite food is phosphorus (p): roots need p to survive and grow. Fertilizers have 3 macronutrients that make it up; (n-p-k) nitrogen-phosphorus-potassium ratio and several micronutrients. When you are picking out a fertilizer for your young plants' root system, look at the middle number. At the beginning of your plants life, this number should be around 15 to 30. I recommend fox farm big bloom from the second watering they get from the time they first pop the surface and gradually getting higher. When done right, I've gotten higher female to male ratios up to 80% twice (usually 60% seems to be the norm) but other times I've gotten 60% male, so it's not an exact science. It is never too early to start feeding your plants as long as you don't over do it, that's why I use fox farm big bloom as it has a very low n-p-k ratio and it's all organic. Never use chemical nutrients on young seedlings or you will burn the root system and possibly kill your plants. Slowly raise the amount of nitrogen you give your plants. This will give you healthy leaf growth during the vegetative period, which means more photosynthesis and a healthy uptake and processing of food. Then there are countless products that are beneficial that you can add to your soil to help the roots work even better than they would have if you didn't use them. I use sub-culture, #2 rated in the world and can be bought in the states unlike the #1 which is strictly for pot, but sub-culture works just as good and is cheaper. I also use ea/en plus actinovate/sp which is a biological fungus control which should never be used on plants before they have at least 2 sets of leaves. Also, plant success, which has 136,200 spores per cc, there are 13 different types of mycorrhizal fungi. If you add plant acids and amino-acids along with stuff like humic acid, both of which helps the fungi. You can get some amazing roots like the pros get without having to go to collage to get a botany degree. Weird looking strain .. Whats wrong with it ?? ?